I spotted these lovely honey mangoes at the market and felt absolutely compelled to take some home. Mangoes, for me, always bring to mind this recipe. It was on the menu at Taste restaurant nearly a decade ago, and even now if I bump into one of the old regulars on the street, this dessert still gets a mention. If you plan on serving this at a dinner party then I’d advise making it the night before. Detach the base from a 22cm / 8 – 9″ round clasp tin and draw round it onto a piece of greaseproof paper, then cut it out. Roll the outer ring of the cake tin in a length of greaseproof to measure the circumference then cut a strip to match its dimensions. 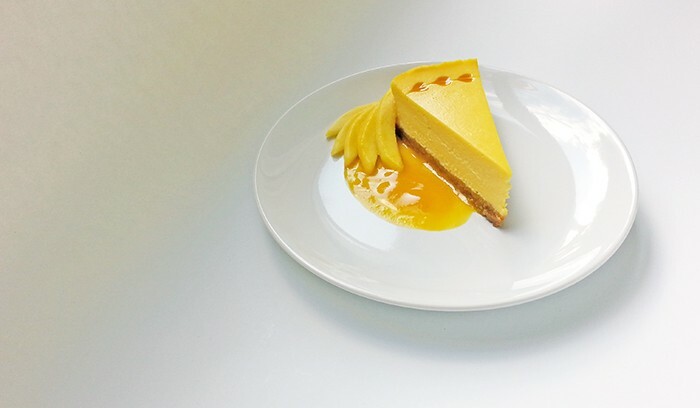 Reassemble the tin then very lightly grease the sides with butter – this will make the paper stick smoothly to the sides so that when you are finished your cheesecake won’t have crinkled edges. Melt the butter and set aside to cool. Put the ginger biscuits into a blender and pulse until they become a fine crumb. Alternatively you could empty them into a large sealable bag and beat them with a rolling pin to get the same results. Stir the cooled melted butter into the biscuit crumbs until thoroughly combined, then pour into the lined baking tin. Shake slightly to help distribute the crumbs evenly then begin to compact the biscuits together. Some people like to use the back of a spoon for this, I prefer to use my flattened hands, or as it only recently occurred to me, if you have another tin the same size, remove the bottom and use the flat side to press down evenly so that you have an inscrutably level base. Put it in the fridge to set for an hour so that the butter can set and prevent the moisture of the cheesecake layer from turning the base soggy. In a fresh bowl, beat together the cream cheese and sugar with a whisk (I find it does the job quicker and more consistently than a spoon). Next add the egg yolks and combine, followed by the remaining eggs one at a time. At this point I switch to a wooden spoon, just because you don’t really want whip up the mixture and create bubbles. Add the mango pulp, the cream and the lime juice, stirring between additions. The cheesecake filling is now ready, but set it aside for the time being. Set a full kettle of water to boil. This will eventually fill a large roasting tin to create a bain-marie (this will prevent the eggs in the mix from becoming more like quiche than set custard). Meanwhile, tear off some large strips of tin foil, and lay them out in a criss-cross fashion. Depending on how resolute your nerves are and how wide your foil is, four layers ought to see you covered, although an extra couple can’t hurt if it brings you piece of mind. These layers of foil will stop the water from the bain-marie from finding its way into your cheesecake through the detachable base of the tin. Gather the foil upwards around the outside of the tin then carefully scrunch the top sections until the foils holds its own shape level with the top of the pan. You can now pour the filling onto the biscuit base. With a tea spoon place small dots of mango pulp at regular intervals around a centimetre from the outside, then use a cocktail stick to slowly draw a line joining up the dots through the middle, which will create a circular trim of hearts. Sit the cheesecake in the roasting tin and place on the middle shelf of the oven, then bring the kettle over and fill roasting tin with the water. Cover with a sheet of greaseproof paper to avoid the top of it catching any colour. This can now be left to cook for about an hour and a half, rotating 180° every half an hour. Ideally, your cheesecake should have a slight jiggle to it when you give it a gentle shake. Remove from the water and peel off the foil. Place the tin on a cooling rack for at least an hour, until the centre of the base feels cool to touch. At this point you can loosely cover with foil and transfer it to the fridge. Allow it to chill for at least 2 hours or overnight. Around 30 minutes before you intend on serving, divide the cheesecake into eight portions. The best way slice a cheesecake without making a horrible mess is to take a wine cooler or your tallest jug and fill it with boiling water. Before each cut you make, submerge the blade of your knife in the water for a few seconds, then wipe dry with kitchen roll. Allow the portions you will be serving to sit at room temperature while you prepare the mango. The texture and flavour of any cheesecake will be drastically improved if you avoid serving it straight from the fridge. 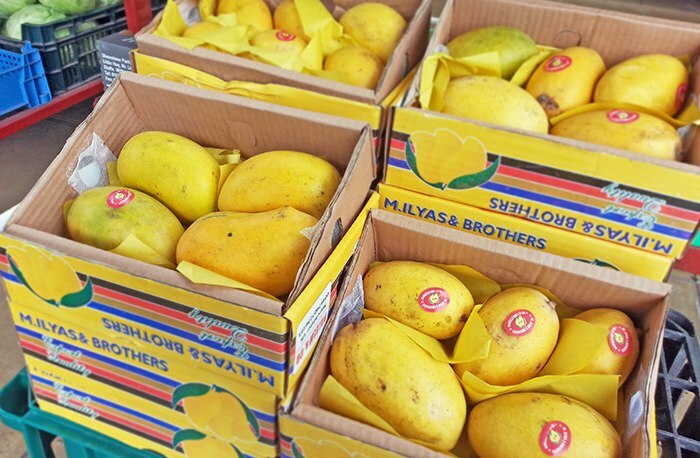 Use a sharp knife or peeler to remove the skin from the mangoes, then slice four ‘cheeks’ off each of them. Each cheek conveniently represents a portion, which you can then finely slice or fan out and serve with a couple of tablespoons of mango pulp.